Dr Alistair Scarfe and Robotics Plus co-founder and chairman Steve Saunders, with his company’s Unmanned Ground Vehicle. Bay of Plenty-based Robotics Plus has attracted another US$8 million worth of investment from Yamaha Motor Co Ltd of Japan to support its ambitious growth plans. 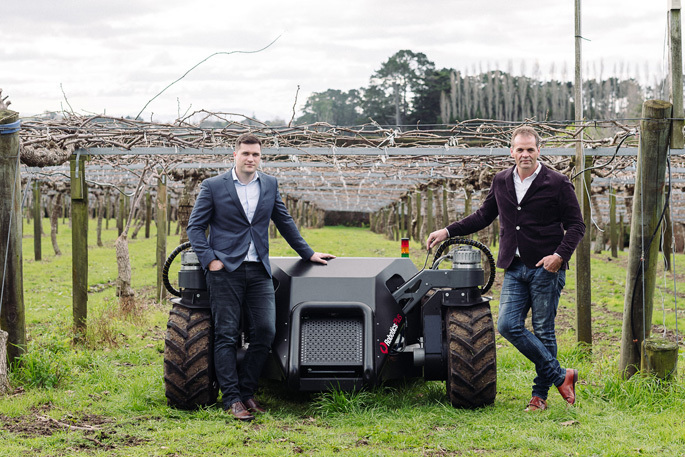 The investment brings Yamaha Motor’s total investment in the NZ agricultural robotics and automation company to $US10m, following a partnership agreement and investment of US$2m in March. Robotics Plus co-founder and chairman Steve Saunders, who is establishing a US subsidiary for the company, says the strengthening partnership with Yamaha Motor and secured additional investment will support the company’s vision to grow into a truly NZ, global business that will transform a number of industries. “This investment will allow us to take the company to the next level and attract and retain the world class talent we need. Yamaha Motor Ventures & Laboratory Silicon Valley CEO Hiro Saijo says they’ve invested in Robotics Plus to help reach their goal to make agriculture more sustainable, healthy, and secure. To accelerate development of their next generation automation solutions, Robotics Plus will leverage Yamaha Motor’s experience, knowledge and technologies in outdoor vehicles, factory automation, robotics, design for manufacturing and manufacturing. Robotics Plus CEO, Dr Matt Glenn, says it’s a mutually beneficial commercial relationship with Yamaha Motor. “We can benefit from their specialist knowledge in precision automation, manufacturing and access to high quality components to help us develop our technologies. “Yamaha Motor can benefit from working with Robotics Plus as a world-leading robotics and automation business focusing on the agricultural and horticultural markets. In May, Robotics Plus’ robotic Aporo apple packers were the first in a suite of technologies to be commercially launched. The apple packer, which identifies and places apples in display trays, can safely handle up to 120 fruit per minute. It’s being marketed by Global Pac Technologies, a Jenkins Group (NZ/Australia) and Van Doren Sales (US) joint venture, and is already operating in packhouses in NZ and the US. Other technologies under development, to address major issues in the horticulture industry caused by labour shortages and increasing consumer demand for fresh fruit, include: an autonomous agricultural vehicle, robotic kiwifruit harvester, robotic pollinator, crop estimator, and a number of confidential projects. Dr Glenn says if we want to solve the big agricultural issues of the future we need to support the horticultural and agricultural industries with innovative solutions that will enable them to do things differently.